Manual Medicine for the Pregnant Patient has two parts and two major themes. The first part is a power point lecture discussing manual medicine for the pregnant patient and the second part is the laboratory demonstration of how to examine and treat the pregnant patient with manual medicine. The two main themes that flow throughout this course are how to examine and treat the whole patient and specific treatment considerations for the pregnant patient. For CME’s: DO’s, MD's and other medical providers. Target Audience: For CME’s: DO’s, MD’s and other medical providers. Understand the physiologic and musculoskeletal changes that occur during pregnancy. Understand the research studies that have been done to support using Manual Medicine during pregnancy. Be able to appropriately examine the pregnant patient for somatic dysfunction. Be able to properly utilize five different Manual Medicine techniques to treat somatic dysfunction in a pregnant patient. Manual Medicine for the Pregnant Patient is 4 Hours. This includes watching the video course, taking the post-test and practicing the techniques. Once you have passed your test we will notify the University of New England College of Osteopathic Medicine (UNECOM) and the American Osteopathic Association (AOA) of your completion of the course. Dr. Patricia (Trish) Murray received her Doctor of Osteopathic Medicine degree in 1999 from UNECOM. Prior to medical school she was a high school teacher for ten years. She completed an osteopathic internship in 2000 at UCONN, followed by a traditional internal medicine residency at UCONN. After residency she practiced primary care internal medicine along with Osteopathic Manipulative Medicine from 2003-2005, and then went on to become a specialist in Neuromusculoskeletal Medicine and Osteopathic Manipulative Medicine (NMMOMM). 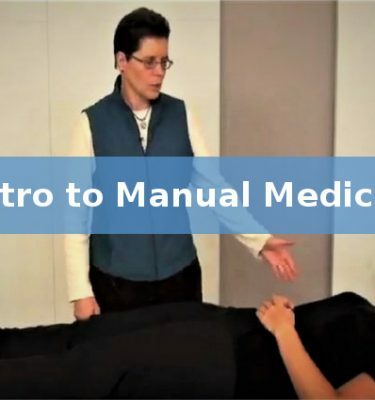 She has taught CME courses in manual medicine for many years and has been asked numerous times to produce a video series that focuses on the lab demonstrations of the different manual medicine techniques taught at the live courses. Dr. Murray has primarily taught manual medicine CME courses at UNECOM in Biddeford, Maine. The University of New England College of Osteopathic Medicine (UNECOM) is accredited by the American Osteopathic Association (AOA) and the Maine Medical Association’s Committee on Continuing Medical Education and Accreditation to provide continuing medical education for medical providers. The AOA Council on Continuing Medical Education approved this online CME activity for a maximum of 4.0 hours of AOA Category 1-B CME credits. UNECOM designates this online CME activity for a maximum of 4.0 AMA PRA Category 1 Credit(s)TM. Practitioners should only claim credit commensurate with the extent of their participation in this activity. Upon verification by the activity organizer, the University of New England College of Osteopathic Medicine will submit the osteopathic credits to the AOA. This activity has been planned and implemented in accordance with the AOA Standards of Accreditation and the Accreditation Council for Continuing Medical Education (ACCME) Essential Areas and Policies through the joint sponsorship of University of New England College of Osteopathic Medicine and the T. Murray Wellness Center, Inc. UNECOM is accredited by the Maine Medical Association Committee on Continuing Medical Education and Accreditation to provide continuing medical education for medical providers. The following speaker of this activity has indicated that she is the creator, sponsor, and benefactor of all in this Manual Medicine Demo Series: Patricia E Murray D.O. Dr. Trish Murray's Training Videos allow you to earn CME credits on your schedule in the comfort of your home or office. More importantly, the videos will provide you with actual manipulation techniques and examples for you to learn by. Subscribe to receive Email alerts when new posts are published. © 2019 OMM Education Series.